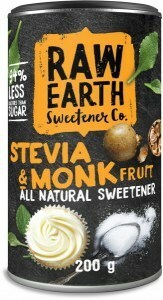 Raw Earth is an all-natural low-calorie sweetener made with a secret blend of stevia and monk fruit extracts. 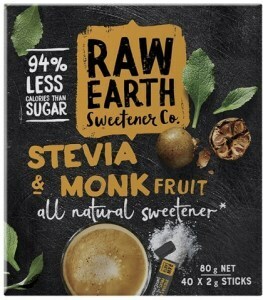 Combining the intense sweetness of stevia with the delicious fruitiness of monk fruit, it has a perfect pure flavour with no bitterness and no effect on blood sugar levels. 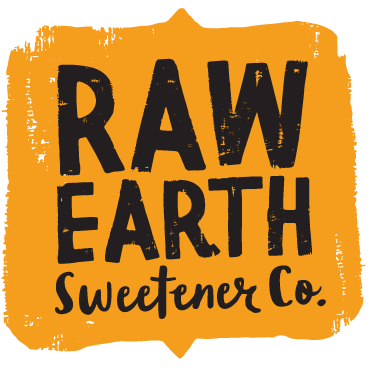 Raw Earth developed their unique tabletop sweetener to provide a healthy option for everyone seeking a little sugar-free sweetness in life. The final formula is an all-natural blend of steviol glycosides from the South American stevia plant with extracts from the monk fruit (luo han guo), a traditional sweetener from the mountains of Southern China and Northern Thailand. The all-natural powder is purely sweet, with no bitter aftertaste, and delicious in coffee and tea as well as baked goods. Safe for diabetics, it has 94% less calories than sugar and no effect on blood sugar levels.